Have you read Jess' post that's full of her narcissistic pictures? Well, you're about to see a similar post but this time is my turn! LOL, please don't roll your eyes. i love the red sweater and stockings..
you are adorable! 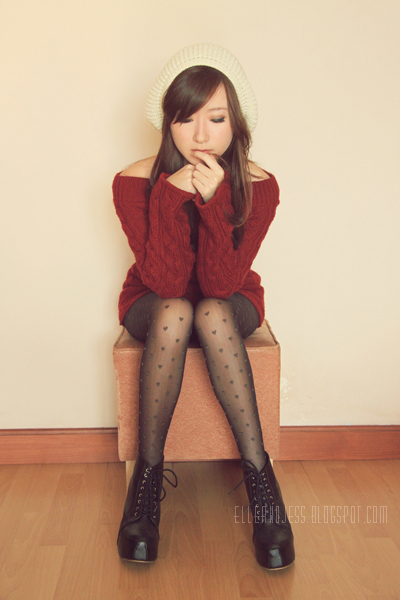 that red sweater looks perfect for the coming fall in cali, and i love the way you styled it with printed tights. i only recently saw your blog off of DecimalShoes, and i'm a fan. Following! i love your sweaterr ! is that from an old zara collection or a new one ? great red color, really like it!! but IMO your sweater is too short if you wear it without short or something. you're so adorable.. I love that red sweater so much!! Maroon is such a gorgeous colour. Plus you can never go wrong with heart stockings and Jeffrey Campbell. Are you from Indonesia as well? What are some unique vintage clothes online stores? love your outfit with red sweater dress. If you are going to transfer large files between mobile devices, one thing comes to mind.